apparent-extent: AE022 Daniel Laufer "Train of Thought"
The Vinyl LP "Train of Thought" by Daniel Laufer (born 1975, lives in Berlin) is part of the exhibition with the same title at Kunstverein Harburger Bahnhof, Hamburg, Germany. "Train of Thought" is the 2nd in a series of artist record editions by Apparent Extent in cooperation with Kunstverein Harburger Bahnhof. "Daniel Lauferâ€™s spatial arrangements combine painting, video, performance, text and music. He uses historic movie-making techniques like filming through matte paintings to create video works distilling what is painted and what is real into a new cinematic space. Daniel Laufer transports these hybrid projections back into the exhibition space, enabling viewers to physically experience their construction. Lauferâ€™s narratives are associative and open. He is continually reflecting on ways of telling stories and making films. His open-ended tales often relate to certain literary motifs, fables or genres. Here at Kunstverein Harburger Bahnhof, located in the former 1st class waiting lounge, Laufer shows an installation of paintings, objects and a two channel video installation revolving around a niche genre of literature called â€˜armchair travelâ€™ or â€˜room travelâ€™ inspired by the French author Xavier de Maistre, writer of "Voyage autour de ma chamber (Voyage Around My Room)" from 1795. The Hungarian film critic BÃ©la BalÃ¡zs (1884 - 1949) described room travel as a state of mind in which one explores a space within the mind. Inside a train station â€“ a transit space defined through high speeds and synchronisation â€“ Laufer plays with the idea of the â€˜room travellerâ€™ who explores the quiet subjective slowness of armchair travel and inertia in movement." Side A of the record features an audio version of Daniel Laufers video installation. The music for "Train of Thought" is based on musical meditations composed and performed live by organist Markus Hinz (DÃ¼sseldorf) and cellist Volker Zander (KÃ¶ln) at St. Antonius, DÃ¼sseldorf. 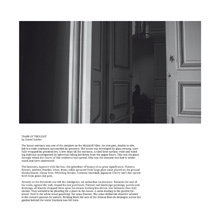 Side B provides a selection of these compositions based only on mental imagery and vague story outlines, recorded in the churches after hours during a late summer night. Simple digital field recording equipment was used in the two hour long session. Extracted from the film the reverb heavy soundtrack material reveal also urban noises like bypassing tram cars on the main street of Oberkassel, DÃ¼sseldorf, submitting dark sub-harmonic rumbling crescendos amplified and echoed through the corpus of the historistic church. Additional music composed and performed by Markus Hinz and Volker Zander, recorded July 29, 2014 at St. Antonius, DÃ¼sseldorf. This record is part of the exhibition "Daniel Laufer â€“ Train of Thought" from November 23, 2014 until February 8, 2015 at Kunstverein Harburger Bahnhof, Hamburg. Thanks to Atalya Laufer and Lorie Quint, Nina KÃ¶ller and Jens Mentrup at KM gallery, Berlin.